The Ceíde Fields (meaning “a flat topped hill” in Irish) is a Neolithic or Stone Age farmed landscape which dates around five thousand years ago. 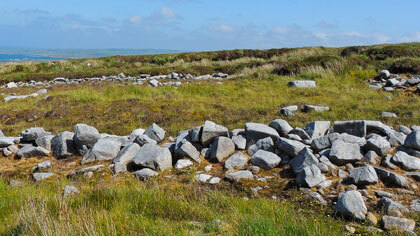 Located in an area of ten kilometres square and nestled on a flat cliff top midway between Broadhaven and Killala Bay, it is the oldest known field systems in the world. 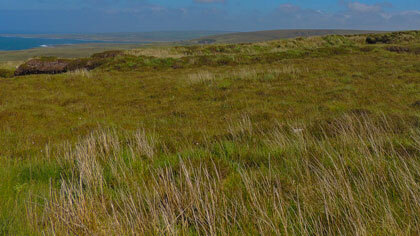 The remains of stone field walls, houses and megalithic tombs are preserved beneath a wild unspoiled bogland. The most important evidence of Ceíde Fields is Archaeology, they tell a story of the everyday lives of a farming people, their organised society, their highly developed spiritual beliefs and their struggle against a changing environment beyond their control. 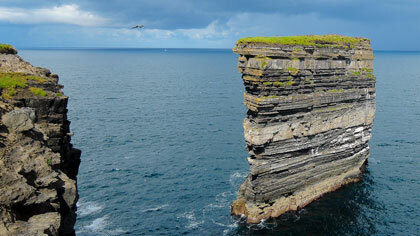 Also Ceíde Fields Cliffs tell the story of the earth through their geology and botany. The experience of walking in these ancient fields makes you aware of these extraordinary stories and that is what Ceíde Fields is about. 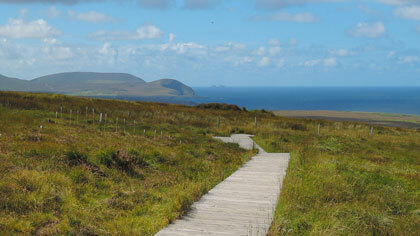 Beneath four metres of bog a different world with a very different landscape lies buried and preserved as it was.